The storyline is in many ways similar to Dorothy Koomson’s ‘My Best Friend’s Girl’ and Rowan Coleman’s ‘The Accidental Mother’ but in other ways it is also very different so don’t think that it is more of the same. It is just as emotional and moving but there are also a couple of unexpected twists that make for quite intriguing reading. ‘Instructions for Bringing up Scarlett‘ moves seamlessly between the past and present. Half of the chapters tell of what happens after Scarlett’s parents, Virginia and Piers, die and how the eleven year old girl comes to terms with what has happens. It also tells of Alice’s efforts to help and support Scarlett and also of quite a few run-ins with Judy, Scarlett’s grandmother and Piers’ mother, who has very strong ideas about how her granddaughter should be brought up. These chapters are all very emotional and definitely found me shedding a few tears as I was reading, but also very enjoyable and uplifting. The alternating chapters go back in time and show Virginia and Piers through their marriage and their desperation to have a baby that almost put an end to their relationship – that was until Scarlett came along and they both became doting parents. These are happier chapters on the whole although there are still stressful times especially when their beloved daughter becomes seriously ill. The reader also gets to know Virginia very well through these chapters as she shares her inner-most thoughts by writing a diary to Scarlett. As I was reading, I really enjoyed the way that the story switched its focus between the past, the diary and the present and it really helped to slowly piece together all that had happened. ‘Instructions for Bringing up Scarlett‘ was the sort of book that had me hooked from the very page. The storyline is absorbing, the characters seem real and also mainly likeable, and I just wanted to keep reading on to find out how it would all turn out. By the time that I reached the 342nd and final page, which did not take me long, I was well satisfied but also left wanting a bit more. 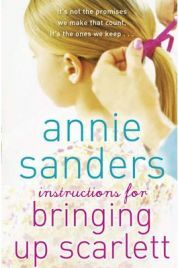 I shall definitely be seeking out more Annie Sanders books in the future. With thanks to publishers for providing a review copy. One Comment on "Instructions for Bringing up Scarlett"